Sleeping Bear Dunes beaches provide an unforgettable sensory experience: gentle waves of the fresh, sapphire-blue water…golden, soft sand between your toes…the warmth of the sun and the kite-catching breeze. When will they figure out how to bottle up that Northern Michigan beach vibe? 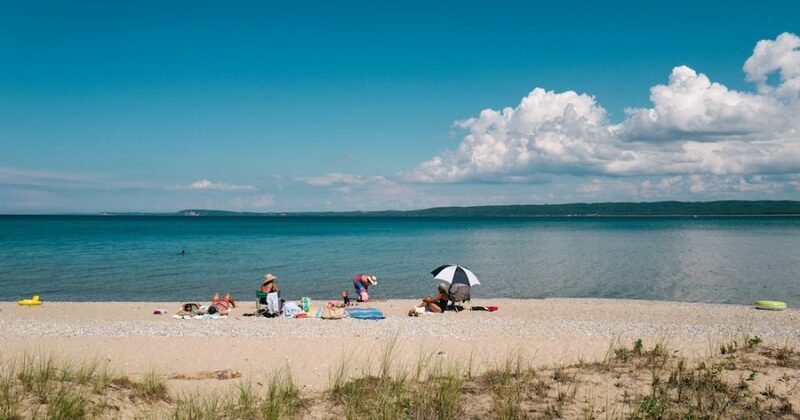 For an easy and fun summer travel idea, take the time to visit both the beautiful beaches within the Sleeping Bear Dunes National Lakeshore and several Leelanau County beaches of nearby Lake Michigan towns. By boat or by car, there’s no beating these gems of Northern Michigan’s outdoors. The Copacabana of Sleeping Bear Dunes. A big, long beach that can accommodate the crowds that flock to it. Views of North Manitou Island, huge swathes of soft sand and a softly-sloping, kid-friendly beach; perfect for a sunset bonfire. Take either County Rd 669 (Bohemian Rd) or 651 (Good Harbor Trail) from M22 near north corner of the Dunes parkland. Paved parking, picnic tables, basic facilities. ↑ To Page Contents. Access this beach from a new stairway descending the steep dunes. The nearest beach to the Pyramid Point hike and Bay View trail; gravel road access means fewer people, but expect more people with the addition of the stairs. From Glen Arbor, drive east 4 miles to Port Oneida Road, then take a soft left on Lane Road. No facilities, dirt road parking, short walk down stairs. ↑ To Page Contents. After visiting the historic village of Glen Haven hit the beach near the Cannery Boathouse Museum. Park at the museum and enjoy not being a dockworker in the early 20th century and views of the Manitou Islands. The beach can also be accessed via Sleeping Bear Point trail. From Glen Arbor, drive west on M109, then turn right onto Glen Haven Road. Facilities nearby, paved parking. ↑ To Page Contents. Hit up this public access to Little Glen Lake to cool off after the Dune Climb. Located kitty-corner from the Dune Climb HQ, the site is a picnic mecca, and a good spot to launch a kayak or canoe for an evening cruise; sand is a tad rocky, the beach is mostly grass. Find the Dune Climb on M109; parking lot for the beach is .5 miles north. Nearby facilities, paved parking, picnic tables, short walk. ↑ To Page Contents. Cool off in Lake Michigan after basking in the warm water of North Bar Lake—a small inland lake that drains into Lake Michigan. The creek between North Bar and Lake Michigan was made for skim boarding, sand dams, and general splashing around. From Voice Road north of Empire, take N. Bar Lake Road to Larahr Road—park and shuffle along the boardwalk to bliss. Unpaved parking, basic facilities, medium walk. ↑ To Page Contents. AKA Otter Creek Beach: the beach is near the mouth of Otter Creek, which gently empties into Lake Michigan. The creek’s shallow water is ideal for splash-happy kids; great for little adventurers to wade upriver and into the belly of the forest. Plenty of sand to park the cooler and beach chairs, and usually not as crowded as Good Harbor. From Empire, drive south on M22; turn right onto Esch Road. Unpaved parking, basic facilities. ↑ To Page Contents. Splitting Esch Road and Platte River Point, Peterson Road beach offers vistas of dunes to the north; lots of sand and a grandstand of beach grass, but quite private—Peterson Road is unpaved. Just east of Platte River Campground, turn off M22 onto Peterson Road and follow to Lake Michigan. Unpaved parking, basic facilities, short walk. ↑ To Page Contents. Trek to Tiesma for the most seclusion; the beach is along the same strip of shoreline as Platte River Point and Peterson Road, yet the beach is unmarked and under the radar. From Platte River Campground, take Lake Michigan Road north, turn right on Isle View Drive, and drive till the road ends. No facilities, dirt road parking, short walk. ↑ To Page Contents. Down the road from the Platte River Campground at the mouth of the Platte River. This finish line for Platte River tubers and rowers means a bustling parking lot, but you’re a short walk away from bathing in the shallows of the river or taking a plunge in the depths of Lake Michigan. Perfect for kids, and views of the Empire Bluffs certainly don’t hurt. Take Lake Michigan Road off M22 near Platte Lake; drive straight to Lake Michigan. Paved parking, picnic tables, basic facilities. ↑ To Page Contents. Boasting a covered picnic pavilion, playground equipment and a pedestrian-friendly village, Empire’s beach is a hub for family’s making a day of it. A straight shot from Traverse City makes getting there easy: from TC, drive west on M72 to Empire, turn right onto M22, then a quick left on Niagara, and drive to the water. Basic facilities, picnic tables, paved parking. ↑ To Page Contents. Plop the towel down on either side of the boat launch for a quick sun by Glen Arbor’s Le Bear Resort; don’t miss the Hawaiian Ice up the street. Head over to nearby Art’s Tavern for a quick, classic bite and some weird taxidermy. Take Lake Street north in Glen Arbor. Roadside parking, no facilities. ↑ To Page Contents. At the southeast corner of Big Glen Lake, the Old Settler’s Picnic Area is just that: the place where the first residents of the Glen Arbor area would kick back on a Sunday evening to watch the sun set. With a gazebo, canoe launch, playground equipment, barbecues and picnic tables, the spot’s perfect for a family afternoon or a post-meal lounge after dinner at eateries La Becasse or Funistrada. From Glen Arbor, drive south on M22 over the Glen Lake narrows, then turn left on County Rd 675; 1500 feet past La Becasse. Basic facilities, paved parking, picnic tables. ↑ To Page Contents. South of the Sleeping Bear Dunes Lakeshore sit the twin towns of Frankfort and Elberta. Separated by the Betsie River, the two towns each have massive sandy beaches with natural dunes nearby. Elberta’s is markedly less crowded, as it a bit less accessible. For Frankfort, take M22 from Empire, and drive west on Main to the water—paved parking, no facilities. For Elberta, continue south on M22, turn left on Frankfort Avenue, continue on to Furnace Avenue, then Bye Street—dirt road parking, no facilities. ↑ To Page Contents. Perfect for everyone who loves the dunes! 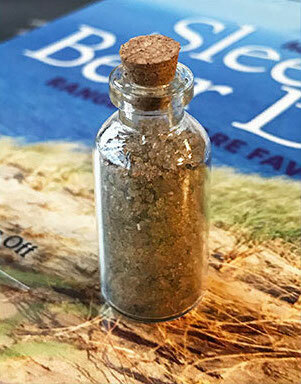 They’ll receive a one-year subscription to Traverse Magazine plus the July ’17 issue with the “Park Rangers’ Favorite Places” and a tiny vial of beach sand.